Travel the world and build your chocolate empire by acquiring and improving your chocolate factories, discovering hidden locations and secret recipes and opening your own shops to get the best prices. 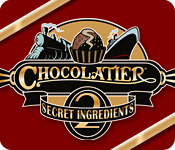 Your friend and ally is Alexandra Tangye, Granddaughter of world famous chocolatier, Evangeline Baumeister. Your job is to help Alexandra overcome her obstacles (namely, her father, Joseph Tangye) to rebuild her family's chocolate empire. Have fun along the way by meeting new characters, beware the "chocolate barons" (namely: Wolf, Christophe, and Tristan) who will try to stop you and play mini games of chance to earn more money. NOTE: This is a VERY large game with many places to discover! I will try to cover everything by breaking the game down by location in alphabetical order and list the ingredients you can buy there along with whether or not they have a factory, a chocolate shop, and or any specialty cacao on a separate plantation. Also, as the game progresses, sometimes new locations appear so be sure to click on every location in every place you go to because new quests will pop up and you need to complete all quests in order to win the game! All ingredients marked with an asterisk (*) means that they are seasonal ingredients and can be VERY pricey when purchased out of season! Ingredients in bold can ONLY be purchased in this city!